Mine rescuers operate in a niche deciding on life and death. And it is not only about the safety of trapped miners, but also the safety of the rescuers themselves, operating in confined spaces, at high heat, darkness and hazardous atmospheres under high levels of physical and mental stress. The mission in Lassing, Austria, proved in 1998 how dangerous this profession is when ten rescuers did not return from the mine. The international cooperation continued and reached the next level 8th and 9th September 2015 in Hanover, Germany. 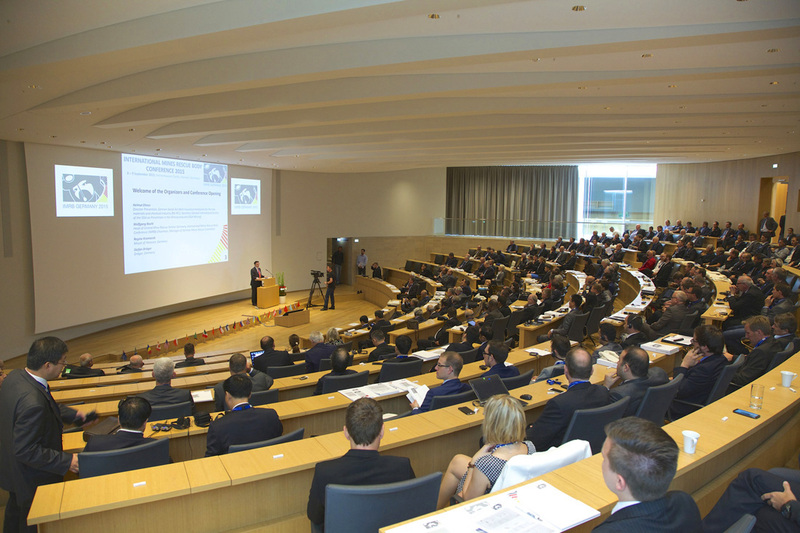 Experts for mine rescue and emergency rescue from all continents came together in Herrenhausen castle to exchange on new insights and development. Hosts were the German Social Accident Insurance Institution for the raw materials and chemical industry (BG RCI), Heidelberg/Germany, as well as ISSA Mining (International Section of the ISSA on Prevention in the Mining Industry) supported by the primary sponsor Drägerwerk AG, Lübeck/Germany. Topics such as “Mine Rescue Management System and Effective Operations”, “Emergency Preparedness” and “Future Trends” have been in the focus, along with expert talks on important connected fields such as dealing with stress during a rescue operation and post-traumatic stress disorders. Five months prior to the Lassing incident in 1998 six rescuers died in the coal mine Niwka-Modrejow, Poland due to heat stress. This led to a conference in Bytom, Poland in the year 2000, close to the scene of the tragic event. The Polish mine authority pursued the aim of analyzing the incident and to avoid tragedies like that from reoccurring. Next to discussing research results and mine rescue strategies, the experts realized that increased international collaboration is of vital need. One year later the conference in Ustron-Jaszowiec meant the onset of the International Mines Rescue Body (IMRB), today uniting more than 20 mining countries as members. The institutions being responsible for mine rescue in their respective country share knowledge on the technological development of equipment, research findings, strategies and practical experience. Bi-annual mine rescue competitions support the joint work in-between the conference years. Following South Africa, Australia, the USA, the Czech Republic, China and Canada Germany was now host of the IMRB. 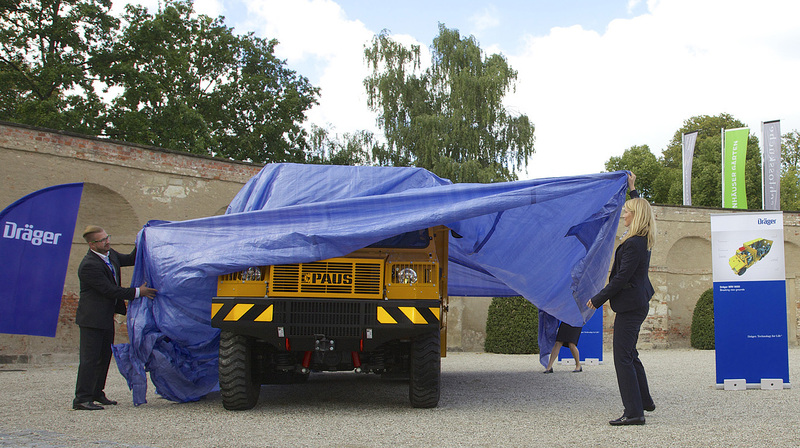 On 8th and 9th September more than 260 experts for mine rescue and emergency rescue from five continents met at Herrenhausen castle to exchange on new developments and insights from emergencies (Figure 1). Next to the main stream of the conference parallel workshops were conducted on “Mine Rescue Management System and Effective Operations”, “Emergency Preparedness” und “Future Trends”. Suppliers of interesting technological solutions showcased at an exhibition – including a world premiere. International keynotes gave insights into safe mining operations and emergency preparedness. Deputy Chairman of the Board of RAG Aktiengesellschaft, Essen/Germany, Peter Schrimpf explained how RAG managed to drastically reduce accidents at work by means of the “TOM model”, covering technology, organization and people. Schrimpf reminded of the dimensions of the past, as the Luisenthal mine disaster in 1962 claiming 299 lives while showing the change German coal mining achieved despite difficult strata conditions – particularly in occupational safety and health. Today, 97 % of RAG’s employees state that RAG does “much” or “very much” for safety and health, Schrimpf quoted the results of a survey. With a 350 head strong team including stand-by RAG is prepared for emergencies in its remaining mines. Which solutions were found in Chile, source of a third of the world copper production, was explained by Roberto Morrison, Member of the Board of Mutual de Seguridad. Among the 70,000 member companies with a total of 1.9 million employees there is many small quarries operating with a staff size between four and six persons which need to be addressed de-centralized. Rescue operations are challenging with high altitudes and in a country stretching some 4,300 km in the north-south direction. The crisis intervention team “ERIC” is ready to cover a wide field up to the care for relatives of people in emergency situations. Occupational safety and health remains an important task in Chile as well, said Morrison; since the rescue of the 33 trapped miners in 2010 in San José 109 fatalities were recorded in Chilean mining. Mining desasters often play a significant role in the awareness of the public, said Hannes Struyweg, Director Health and Safety of the International Council on Mining & Metals (ICMM). Do parents want their children to work in this sector? The worldwide association of large mining corporations also deals with safety and health up to aspects such as the ageing workforce – a challenge even in developing countries. By means of „Critical Control Management“ ICMM members want to learn from incidents in high risk areas and are positive that these promise a more relevant insight than LTI’s in general. There is no sufficient correlation between these two categories, said Struyweg. Stefan Dräger found huge interest with his keynote. His company Drägerwerk AG from Lübeck/Germany was the primary sponsor of IMRB 2015. The history of Drägerwerk AG is closely connected to mine rescue for decades showed his view into the timeline. Dräger recognized that “Dragerman“ is actually the term for the profession of a mine rescuer in North America. A new facet compared to previous IMRB conferences was the extension into interdisciplinary fields. In his talk „A Look beyond the Garden Gate: New Solutions for Rescue in Offshore Windenergy-Fields“ Dr Markus Stuhr explained a project remodeling the first aid and fast rescue of hurt and sick patients from wind parks in the North Sea and the Baltic Sea. This fast growing economic sector expects 1,000 to 2,000 employees permanently offshore; first aid and rescue are challenging in matters of logistics. Aspects to be considered are large distances, confined spaces, rescue from heights at levels of 100 m above sea level as well as low entry points in a stormy sea. The answers found in this project proved to be of high relevance for the attending mine rescuers as well. The introduced solutions include improved equipment, extended first aid training and telemedical support. Another talk finding huge interest was given by Rudi Hiebl, explaining the rescue operation around the hurt cave researcher Johann Westhauser in the Bavarian Riesending cave in 2014. The multinational team consisted of several hundert helpers stemming from five different countries, out of which more than 200 operated underground at the same time at a depth of around 1,000 m.
The almost 40 talks given at IMRB 2015 also included the findings of scientific work. Felix Lehnen of the mining university RWTH Aachen/Germany showed findings made during the European research project „I2 Mine“ including innovative concepts for emergencies. Parallel workshops combined contributions on “Mine Rescue Management System and Effective Operations”, “Emergency Preparedness” and “Future Trends” (Figure 2). During the management workshop participants learned about intelligent software solutions driven by decades of practical experience from experts. Lessons learned from incidents such as Lassing were reflected in analytical evaluations which showed the complexity of rescue operations performed by a large number of different stakeholders – including recommendations on how to keep control and best use important time needed to save people’s lives. How small-scale mining operations can be integrated into rescue concepts and what type of solutions were found by operators of complex plants was demonstrated by the speakers of the workshop “Emergency Preparedness”. Under the thematic frame „Future Trends“ the participants discussed innovative technology for early detection of underground fires, the design of rescue rooms, communication during rescue operations and how to deal with gas outbursts. Within the frame of the IMRB suppliers showcased personnel protective equipment as well as systems for early detection and intervention. A particular highlight was the unveiling of MRV 9000, a vehicle designed by the Drägerwerk AG in cooperation with Goldcorp from Canada to get mine rescuers to the action faster over long distances and to transport injured miners. Among other one of the reasons for the new concept was that the reach of the BG4 devices was not sufficient for the long roadways in Goldcorp’s mines. The joint project of Drägerwerk AG, Hermann Paus Maschinenfabrik GmbH, Emsbüren/Germany, and Goldcorp was presented by Dräger head Stefan Dräger and Goldcorp’s Markus Uchtenhagen as a world premiere in Hanover (Figure 3). The unanimous feedback of all delegates was very positive. They appreciated the informative discussions and their relevance for the practical work, the workshop concept with its summaries and the atmosphere of hospitality. Germany left an excellence reference many said. The chance to connect was seen as the paramount opportunity by all participants, just as ISSA Mining Secretary General Helmut Ehnes stated during the opening during his keynote “Vision Zero and the Seven Golden Rules – the Global Prevention Strategy of ISSA for Rescue and Beyond“. The collaboration of ISSA Mining with partners such as the ICMM extended the focus in comparison with prior conferences until 2013. Another novelty was the concept of three parallel workshops on specialized topics and the summaries given in the auditorium for all. Also in the balancing view of host and member of the BG RCI board Ulrich Meesmann the approach worked well. Connecting efficient rescue operations and self-protection matches the international prevention strategy “Vision Zero”. Meesmann called upon the international audience to further intensify cooperation, not only limited to conferences. After Germany Russia will be the next IMRB host. In 2017 the top stakeholders of mine rescue will meet in Moscow, St. Petersburg and the Siberian Novokuznetsk on the occasion of the 8th IMRB conference. With the motto “Extending knowledge, improving safety” the summit will run 2nd to 13th September in Europe and Asia. Information is going to be published at www.imrb2017.ru. Even before this the mine rescue experts will come together again: the „International Mines Rescue Competition” will take place in 2016 in Canada. After the insights into the last competition in Poland as given in a film clip shown by Adam Nowak, Alex Gryska as the next host reminded of the importance of honing skills with less operations occurring. The foreseen 30 teams from 20 countries will find realistic scenarios at different Canadian sites. “It’s not about winning, it’s about learning”, underlined Gryska. Information can be found at www.imrc2016.ca.